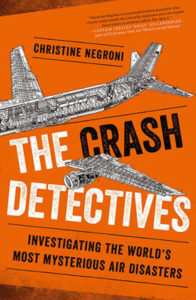 From the title “Crash Detectives,” one would assume that this book is a behind the scenes look at the work crash investigators undertake when trying to determine the cause of aircraft accidents. The book looks at many aircraft accidents, but the focus isn’t so much on the investigation process. Author Christine Negroni’s goal, as I see it, is to defend her opinion that the disappearance of Malaysia 370 was more likely a result of a mechanical failure as opposed to pilot suicide. In that effort, the author provides numerous cases of other accidents that might shed light on her theory regarding MH 370 of crew incapacitation due to loss of cabin pressure. All the accidents covered in the book, and there are many, are in some way tangentially connected to the disappearance of Malaysia 370. The book begins with another aircraft mystery: the disappearance of a Pan Am Clipper flying boat in 1938. 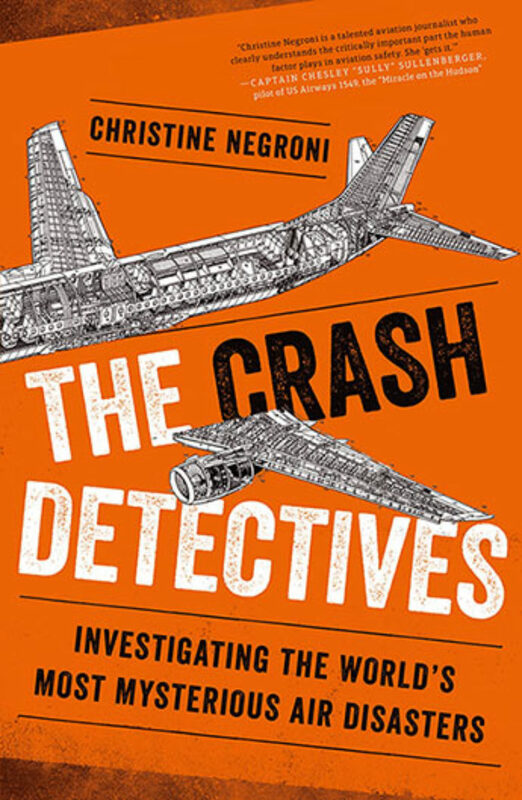 From there, author Negroni looks at dozens of accidents involving various scenarios that might also be related to Malaysia 370: accidents involving fire, loss of pressurization, alleged pilot suicide, mechanical failure, system failures, engineering failures, power loss, and many more. None of the accidents are looked at in depth, but the combined effect is to demonstrate that accidents occur due to many different factors and the first impression is not always the right one. I’ll state upfront that I happen to agree with the author’s belief in mechanical failure rather than pilot suicide in the case of MH 370. I have followed the search for the aircraft and the many expert opinions as to what might have happened. But I have not delved deeply into the investigation. I did not know, for example, that the first officer was new to the plane with less than forty hours of flight time on the Boeing 777. That is a significant detail. Here’s why. I have over 30,000 of flight time. I am type rated in five different aircraft. But even with all that experience, when I get checked out in a new aircraft the first 100 hours or so can be stressful. That’s because I don’t have the familiarity with the aircraft to feel comfortable. If something were to happen in that first 100 hours, I am much more likely to make mistakes in handling the problem despite my experience. That’s why airlines have rules in place where you never place a new captain and a new first officer on a flight. At least one pilot needs to have 100 hours or more. The captain of Malaysia 370 was an experienced 777 pilot. But if the captain were to leave the cockpit to use the restroom, and something were to happen while he was out, such as a rapid depressurization, the scenario Christine puts forth seems plausible. There were other details about the Malaysia 370 mystery that I was unaware of. I did not know that mechanics had serviced the cockpit oxygen bottles prior to the flight. Christine describes a scenario where there is a rapid depressurization for unknown reasons while the captain is out of the cockpit, and the first officer correctly dons his oxygen mask but, due to a mistake by the mechanics, the supply valve was left partially closed preventing the first officer from getting much needed oxygen. An inexperienced pilot, faced with a demanding emergency, hampered by confusing warnings and possible hypoxia, explains a lot about what could have happened. As a professional pilot, I tend to shy away from aviation books. I spend enough time on planes to not want to also read about them. But Christine’s book kept me interested throughout. My only complaint, and this is on the publisher and not the author, has to do with images. There is no excuse why the images could not have been placed in context as opposed to appearing at the end of the book. It’s an eBook. It might take a few extra steps in the conversion process, but images in context add to the reading experience.